Is Apple Music actually working on Android? You are here: GeekSays Technology News » Apple » Is Apple Music actually working on Android? Apple Music, the Cupertino-based company’s new music streaming service, is definitely a hit, as, according to CEO Tim Cook, it already managed to reach 15 million subscribers. And apparently, it’s so good that the company is considering to expand the service reach, as more and more rumors are pointing to this. The folks from German tech site Mobile Geeks might have the biggest surprise related to Apple Music, though. 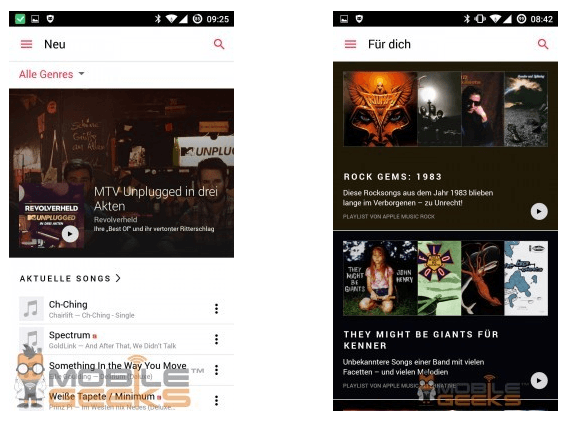 It seems that the service will also be available for Android devices, as they have posted a set of screenshots clearly showing Apple Music running on a phone powered by Google’s mobile operating system. The interface looks a lot like the one on iOS, but it does have some design elements specific to Android, like the menu on the top right cornet. Our recommendation is to avoid getting to excited about this, as we don’t have a certitude that these images are genuine. They might as well be snapped from an iPhone and modify the status bar in Photoshop, in order to like like the one on Android. On the other side, even if Apple Music will be available for Android, these images are just from a test or from a beta version of it and this doesn’t mean that the app will be available in Google Play any time soon. MobileGeeks is well known for being accurate when it comes to previous Android rumors. Also, this isn’t the first time when an Android version of Apple Music is mentioned. Finally, we won’t be surprised if this turns out to be real, as Apple is aiming to reach a very big number of users with their service. And let’s face it, the number of Android users is huge, so targeting them would be a very smart move for Apple.